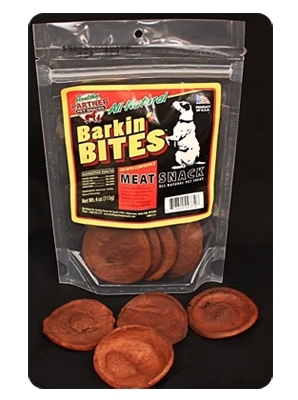 Barkin' BITES 4 oz. Bag - All Natural 100% Beef & Turkey Dog Treat. Softer variation of "Healthy Partner" Jerky Treats. A wholesome, delicious, all natural treat for your pet made from the finest quality Natural American Beef & Turkey products. Reward your "Healthy Partner" with complete confidence. Product of U.S.A.